Bailey Greenberg stood tall holding a giant Hershey’s chocolate bar. No, really, a giant chocolate bar, courtesy of the hosts from Hershey’s Giant Center. To say the victory was sweeter than the humongous chocolate treat is putting it mildly. Greenberg is one of only two senior Vikings; starting guard Claire Bassetti is the other. 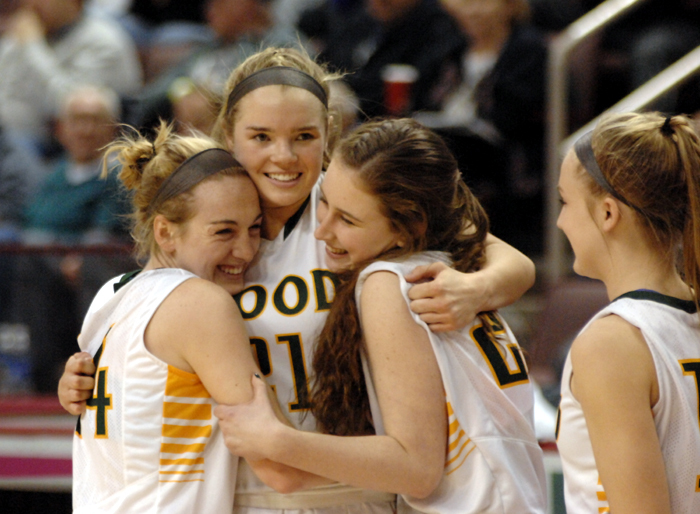 The rest of the crew is comprised of older-than-they-appear juniors and sophomores, and several of those underclassmen contributed mightily to Wood’s fourth-ever state title (the Vikings orchestrated a three-peat from 2010-12) in what was their sixth visit in seven years to the state’s marquee event. Ask Greenberg and Bassetti a question and prepare to hear plaudits about the youngsters. Ask the youngsters, and they’ll rave about the veterans. For coach Mike McDonald, who took over the program toward the end of last year and mentored them to two straight Catholic League championships – the Vikings stunned previously undefeated Neumann-Goretti in the Catholic League championship on Feb. 21 – and two state finals, team camaraderie has been a constant plus during his tenure that began with him as an assistant coach. Although Greenberg was outstanding despite often being double-teamed, finishing with a game-high 14 points, 13 rebounds and a pair of assists, steals and blocks, it was the play of the underclassmen that provided the knockout blow against a Villa Maria team that entered the contest 29-0. Although sophomore Kate Connolly (eight points, four rebounds, four blocks), junior Shannon May (five points, four rebounds, two steals), and junior Cassie Sebold (seven points) also proved pivotal, sophomore Katie May, the younger sister of Shannon, turned the game’s momentum in the second quarter. Trailing 8-5, May scored Wood’s next seven points and, combined with a basket by Greenberg, Wood took a 15-14 lead and never looked back. Entering the final stanza, Wood led, 27-21. If Villa had any plans of a comeback, it quickly evaporated. Greenberg scored four quick points, and Connolly and Shannon May both drilled three-point shots. With 3:30 left in the game, the Vikings had commandeered full control as they led, 37-24. Six late free throws increased their advantage to 46-27 inside the final minute. When the buzzer sounded, the Vikings flooded the court, piling atop one another in utter glee. A season that had begun with a 4-6 record against national-level competition had ended with a 25-6 record, a 21-game winning streak and consecutive Catholic League, district and state titles. May was then asked about the two outgoing seniors. About 20 minutes after her team’s celebration and a subsequent television interview, Greenberg discussed what may have been the most important game of her young career as she jaunts toward Drexel University next season. Among the onlookers were Wood athletic director Joe Sette and principal Mary Harkins. They could not have been more proud. McDonald, whose assistants include his mother, Mary, a former Cardinal Dougherty head coach, fielded several questions regarding the fact that Wood had to sever undefeated records in both the Catholic League and state final. He didn’t dwell on his opponents’ records. 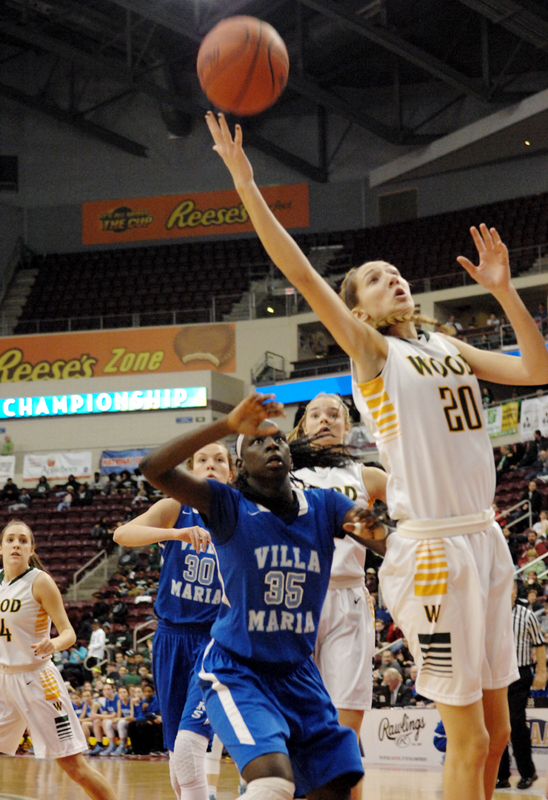 Unfortunately for those teams, Archbishop Wood was better. 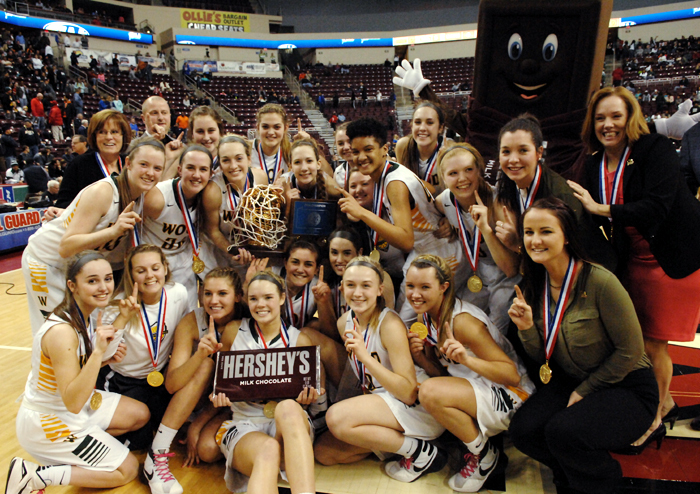 Archbishop Wood’s girls and supporters celebrate the Vikings’ class AAA PIAA state championship victory March 18 in Hershey, Pa.